Live Blog is a live blogging platform developed by Sourcefabric, designed to enable users to publish events as they occur in real-time. The advent of social media has revolutionized the way news is delivered. It’s not news if it’s not on Facebook and Twitter. With Live Blog, journalists are able to share minute-by-minute updates on events and utilize social media channels to give fresh news to their audience as they happen. Intended for journalists in the field as a tool to help them broadcast live events to their audiences on multiple platforms and devices, Live Blog comes with a vast collection of features that allow them to manage and curate their content, engage their audience, monitor the performance of the content and how their audience react, and fully monetize their content via advertising and sponsorships. 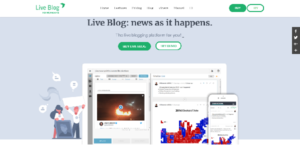 Live Blog is an open-source live blogging platform developed by Sourcefabric, the largest developer of open source tool used by news media organisations from around the world. Live Blog could be used by a variety of organisations including: news agencies, online news media, event organisers, conferences, bloggers, sport events, etc. That means you get tools that are specific and unique to your work as a journalist and none of the features that you don’t need. On top of that, the software is continuously developed, with new sets of features being added on a regular basis. Live Blog enables you to reach your audience and update them with text and images using your mobile phones. Thanks to its mobile reporter app, you can easily publish news and updates with images to your websites right at the palm of your hands. All Live Blog themes are designed to work with mobile screens, which means your audience can read your texts and view your images in crisp, clear quality using their smartphones and tablets. Live Blog’s API lets you move your content anywhere, anytime. You have full control and ownership over your content and when you decide to export your content to another platform, Live Blog makes the transition painless for you. What Problems Will Live Blog Solve? News organizations often need to cover breaking news (natural disaster, a shooting, a fire, a tornado – it could be anything) or minute by minute updates. Live Blog is the tool for doing exactly that. Live Blog enables its users to share live text coverage and minute-by-minute updates on the news items they are covering directly with their audience. Live Blog is fast, intuitive and flexible, letting journalists do their best when they arrive on the scene. Organizations that would like to make money out of their coverage. Live Blog lets its users deliver their blogs with native or remote ads integrated into the regular timeline of posts. Some news organizations are also using Live Blog as a “slow blog,” which is a news format that allows publishers and their readers to follow a certain topic over a longer period of time. For example, the German news agency DPA used this format to keep their readers informed about the refugee crisis as it developed over several months or sports media websites use Live Blog to report on football transfers news & rumors throughout the summer as well as the winter period. With the Live Blog 3 SEO Default Theme users can produce their live blog content in a way that it can be directly injected into their articles (instead of using the iFrame). In that way, the live blog content will become more visible in web searches. When the text of the live blog post appears as native content to search engines — i.e. it “reads” as part of all the rest of the content on a news organization’s site — it raises the profile of that news organization’s coverage in new web searches as well as to its existing audience. If you are considering Live Blog it could also be sensible to examine other subcategories of Best Blog Software listed in our base of SaaS software reviews. There are trendy and widely used solutions in each software group. But are they essentially the best fit for your company’s special requirements? A trendy software product may have thousands of subscribers, but does it present what you require? For this reason, do not blindly spend on popular systems. Read at least a few Live Blog reviews and think about the aspects that you desire in the software such as the fees, main features, available integrations etc. Then, choose a few apps that fit your wants. Try out the free trials of these platforms, read online opinions, get information from the vendor, and do your research systematically. This exhaustive groundwork is sure to assist you select the most excellent software solution for your firm’s specific needs. How Much Does Live Blog Cost? We realize that when you make a decision to buy Blog Software it’s important not only to see how experts evaluate it in their reviews, but also to find out if the real people and companies that buy it are actually satisfied with the product. That’s why we’ve created our behavior-based Customer Satisfaction Algorithm™ that gathers customer reviews, comments and Live Blog reviews across a wide range of social media sites. The data is then presented in an easy to digest form showing how many people had positive and negative experience with Live Blog. With that information at hand you should be equipped to make an informed buying decision that you won’t regret. What are Live Blog pricing details? What integrations are available for Live Blog? If you need more information about Live Blog or you simply have a question let us know what you need and we’ll forward your request directly to the vendor.